The cougar (Puma concolor), also puma, mountain lion, or panther, depending on region, is a mammal of the Felidae family, native to the Americas. This large, solitary cat has the greatest range of any wild terrestrial mammal in the Western Hemisphere, extending from Yukon in Canada to the southern Andes of South America. An adaptable, generalist species, the cougar is found in every major American habitat type. It is the second heaviest cat in the American continents after the jaguar, and the fourth heaviest in the world, along with the leopard, after the tiger, lion, and jaguar, although it is most closely related to smaller felines. A capable stalk-and-ambush predator, the cougar pursues a wide variety of prey. Primary food sources include ungulates such as deer, elk, and bighorn sheep, as well as domestic cattle, horses, and sheep, particularly in the northern part of its range, but it also hunts species as small as insects and rodents. Moreover, it prefers habitats with dense underbrush and rocky areas for stalking, but it can live in open areas. The cougar is territorial and persists at low population densities. Individual territory sizes depend on terrain, vegetation, and abundance of prey. While it is a large predator, it is not always the dominant species in its range, as when it competes for prey with other predators such as the jaguar, Gray Wolf, American Black Bear, and the Grizzly Bear. It is a reclusive cat and usually avoids people. Attacks on humans remain rare, despite a recent increase in frequency. 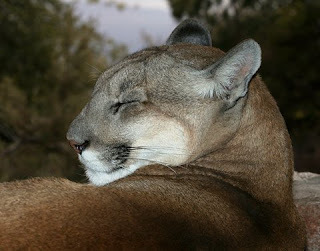 Due to persecution following the European colonization of the Americas, and continuing human development of cougar habitat, populations have dropped in many parts of its historical range. 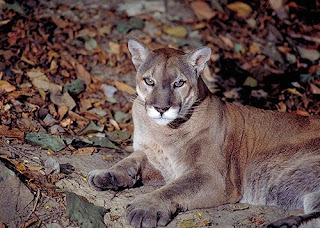 In particular, the cougar was extirpated in eastern North America, except an isolated sub-population in Florida; the animal may be recolonizing parts of its former eastern territory. 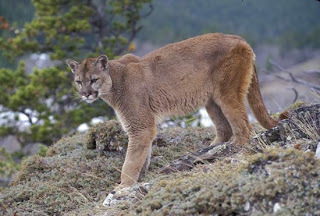 With its vast range, the cougar has dozens of names and various references in the mythology of the indigenous Americans and in contemporary culture. 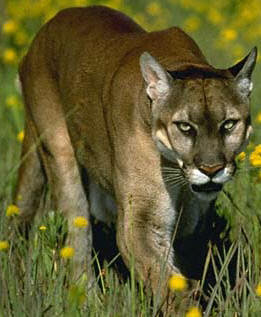 The cougar has numerous names in English, of which puma and mountain lion are popular. Other names include catamount, panther, and mountain screamer. Lexicographers regard painter as a primarily upper-Southern U.S. regional variant on "panther", but a folk etymology, fancying a resemblance between the typically dark tip of its tail and a paintbrush dipped in dark paint, has some currency. The cougar holds the Guinness record for the animal with the highest number of names, presumably due to its wide distribution across North and South America. It has over 40 names in English alone. "Cougar" is borrowed from the Portuguese çuçuarana, via French; the term was originally derived from the Tupi language. A current form in Brazil is suçuarana. "Puma" comes, via Spanish, from the Quechua language. The Cougar is the largest of the small cats. It is placed in the subfamily Felinae, although its bulk characteristics are similar to those of the big cats in the subfamily Pantherinae. The family Felidae is believed to have originated in Asia approximately 11 million years ago. Taxonomic research on felids remains partial and much of what is known about their evolutionary history is based on mitochondrial DNA analysis, as cats are poorly represented in the fossil record, and there are significant confidence intervals with suggested dates. In the latest genomic study of Felidae, the common ancestor of today's Leopardus, Lynx, Puma, Prionailurus, and Felis lineages migrated across the Bering land bridge into the Americas approximately 8 to 8.5 million years (Ma) ago. The lineages subsequently diverged in that order. North American felids then invaded South America 3 Ma ago as part of the Great American Interchange, following formation of the Isthmus of Panama. The cougar was originally thought to belong in Felis, the genus which includes the domestic cat, but it is now placed in Puma along with the jaguarundi, a cat just a little more than a tenth its weight. Studies have not indicated that the cougar and jaguarundi are most closely related to the modern cheetah of Africa and western Asia, but the relationship is unresolved. It has been suggested that the cheetah lineage diverged from the Puma lineage in the Americas (see American cheetah) and migrated back to Asia and Africa, while other research suggests the cheetah diverged in the Old World itself. The outline of small feline migration to the Americas is thus unclear. Recent studies have demonstrated a high level of genetic similarity among the North American cougar populations, suggesting that they are all fairly recent descendants of a small ancestral group. Culver et al. suggest that the original North American population of Puma concolor was extirpated during the Pleistocene extinctions some 10,000 years ago, when other large mammals such as Smilodon also disappeared. North America was then repopulated by a group of South American cougars. The status of the Florida panther, here collapsed into the North American Cougar, remains uncertain. It is still regularly listed as subspecies Puma concolor coryi in research works, including those directly concerned with its conservation. Cougars are slender and agile cats. Adults stand about 60 to 76 cm (2.0 to 2.5 ft) tall at the shoulders. The length of adult males is around 2.4 m (8 ft) long nose to tail, with overall ranges between 1.5 and 2.75 meters (5 and 9 ft) nose to tail suggested for the species in general. Males have an average weight of about 53 to 72 kilograms (115 to 160 pounds). In rare cases, some may reach over 118 kg (260 lb). Female average weight is between 34 and 48 kg (75 and 105 lb). Cougar size is smallest close to the equator, and larger towards the poles. The head of the cat is round and the ears erect. Its powerful forequarters, neck, and jaw serve to grasp and hold large prey. It has five retractable claws on its forepaws (one a dewclaw) and four on its hind paws. The larger front feet and claws are adaptations to clutching prey. 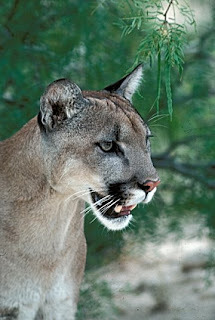 Cougars can be almost as large as jaguars, but are less muscled and powerful; where their ranges overlap, the cougar tends to be smaller than average. The cougar is on average as heavy as the leopard. Despite its size, it is not typically classified among the "big cats," as it cannot roar, lacking the specialized larynx and hyoid apparatus of Panthera. Like domestic cats, cougars vocalize low-pitched hisses, growls, and purrs, as well as chirps and whistles. They are well known for their screams, referenced in some of its common names, although these may often be the misinterpreted calls of other animals. Cougar coloring is plain (hence the Latin concolor) but can vary greatly between individuals and even between siblings. The coat is typically tawny, but ranges to silvery-grey or reddish, with lighter patches on the under body including the jaws, chin, and throat. Infants are spotted and born with blue eyes and rings on their tails; juveniles are pale, and dark spots remain on their flanks. Despite anecdotes to the contrary, all-black coloring (melanism) has never been documented in cougars. Cougars have large paws and proportionally the largest hind legs in the cat family. This physique allows it great leaping and short-sprint ability. An exceptional vertical leap of 5.4 m (18 ft) is reported for the cougar. Horizontal jumping capability is suggested anywhere from 6 to 12 m (20 to 40 ft). The cougar can run as fast as 55 km/h (35 mph), but is best adapted for short, powerful sprints rather than long chases. It is adept at climbing, which allows it to evade canine competitors. Although it is not strongly associated with water, it can swim. A successful generalist predator, the cougar will eat any animal it can catch, from insects to large ungulates. Like all cats, it is an obligate carnivore, feeding only on meat. The Mean weight of vertebrate prey (MWVP) was positively correlated (r=0.875) with puma body weight and inversely correlated (r=-0.836) with food niche breadth in all America. In general, MWVP was lower in areas closer to the Equator. Its most important prey species are various deer species, particularly in North America; mule deer, white-tailed deer, elk, and even the large moose are taken by the cat. Other species such as Bighorn Sheep, wild horses of Arizona,domestic horses, and domestic livestock such as cattle and sheep are also primary food bases in many areas. A survey of North America research found 68% of prey items were ungulates, especially deer. Only the Florida Panther showed variation, often preferring feral hogs and armadillos. Investigation in Yellowstone National Park showed elk followed by mule deer were the cougar's primary targets; the prey base is shared with the park's gray wolves, with whom the cougar competes for resources. Another study on winter kills (November–April) in Alberta showed that ungulates accounted for greater than 99% of the cougar diet. Learned, individual prey recognition was observed, as some cougars rarely killed bighorn sheep, while others relied heavily on the species. In the Central and South American cougar range, the ratio of deer in the diet declines. Small to mid-size mammals are preferred, including large rodents such as the capybara. Ungulates accounted for only 35% of prey items in one survey, approximately half that of North America. Competition with the larger jaguar has been suggested for the decline in the size of prey items. Other listed prey species of the cougar include mice, porcupine, and hares. Birds and small reptiles are sometimes preyed upon in the south, but this is rarely recorded in North America. Though capable of sprinting, the cougar is typically an ambush predator. It stalks through brush and trees, across ledges, or other covered spots, before delivering a powerful leap onto the back of its prey and a suffocating neck bite. The cougar is capable of breaking the neck of some of its smaller prey with a strong bite and momentum bearing the animal to the ground. It has a flexible spine which aids its killing technique. Kills are generally estimated at around one large ungulate every two weeks. The period shrinks for females raising young, and may be as short as one kill every three days when cubs are nearly mature at around 15 months. The cat drags a kill to a preferred spot, covers it with brush, and returns to feed over a period of days. It is generally reported that the cougar is a non-scavenger and will rarely consume prey it has not killed; but deer carcasses left exposed for study were scavenged by cougars in California, suggesting more opportunistic behavior.